Now, you may not pay much attention to your wiper blades on your windshield. However, they are an important safety feature for your car. They are what help to maintain visibility, regardless of what the weather is like outside. This means that the wipers go through a considerable amount of use and abuse, sometimes on a daily basis. At some point, you are going to need to replace the set that you have. If you live in a particular cold area or experience really harsh winters, then this 26 inch ICON wiper blades are for you. This is because they have been specifically designed to withstand such weather conditions. This is largely due to the enclosed tension spring which helps to keep the blade flexible and moving, even when it is really icy or the winds are particularly strong. The other feature that these wiper blades boast are the asymmetrical flexible spoiler design. This is so that the wipers are capable of being more aerodynamic. This comes in handy when the car has picked up speed and there is considerable amount of wind pushing down on the wiper blades. The design enables the wipers to use the airflow to their advantage, allowing them to easily move back and forth. Another great thing is that with these wiper blades, you really are making an investment. They have been built to be as durable as possible. They are capable of withstanding heat and other environmental conditions. As a result, they are likely to last about 40 times longer than other brands. If you are looking for wiper blades that are easy to install, then these ones will certainly be what you are looking for. You are not going to need any help at all setting them up. They come pre-installed with j-hook adaptors but also have multi adaptors to ensure that they can fit onto a variety of blade arms. One thing you will certainly not have to worry about with these wiper blades is that they will wear out anytime soon. First, it has a galvanized steel frame at its center. This means that it is resistant to both rust and corrosion, even if it gets wet quite frequently. The squeegee rubber has also been manufactured to certain specifications. As a result, it is not prone to cracking, tearing, splitting, or any other damage. It will not be destroyed either by the weather conditions or any other typical factors that may contribute to such ruin. You will also not have to deal with streaks across your windshield as the wipers use embedded friction reducers across multiple pressure points. One of the most important features of wiper blades is to ensure that the windshield is kept as clean and clear as possible. Well, this Bosch wiper blade does precisely that. One of the features that accommodate that are the spoilers which are symmetrical and aerodynamic. This means that with each wipe, you get the same consistent action. The other component are the patented bracketless design on these wipers. In particular, they have been created to have special resistance to both snow as well as ice. This means that even during a snowstorm, you can be reassured that you are going to have the best possible visibility. The rubber on the wiper blades has also been cut very precisely and are made from natural rubber. This means that even the smallest speck of dirt or the lightest drop of water are immediately and effectively removed. You can also be certain that even if you travelling at a high speed, your wipers will be properly functioning. Last but not least, the wiper blades are also really quiet while working. If you don’t want to spend too much of money replacing your wiper blades, then this is the perfect choice for you. What’s more, you can easily replace the wiper blades yourself without any hassle. This is thanks to the KwikConnect Installation System. This alerts you to whether or not you have correctly installed your wiper blades. The blades are available in lengths of between ten inches and twenty eight inches. While these may be more affordable than most other wiper blades, this does not make them any less efficient. There are numerous features which enable you these wiper blades to offer up a superior performance. One of these is the DuraKlear rubber compound. This means that every time your wipers move back and forth, your windshield is kept clear and streak-free. It does not matter what type of weather you are driving in or what kind of external conditions there are. The result will always be the same. Therefore, you can be certain that you are purchasing a reliable and efficient set of wiper blades when buying this model. 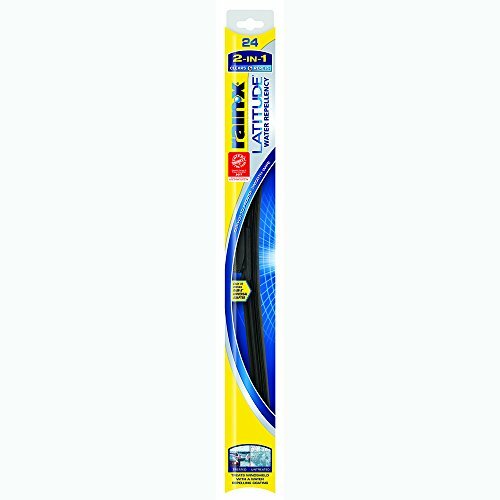 These Rain-X wiper blades are great for any climate or season. Nonetheless, they have been proven to be especially beneficial to those living in more icy climes. This is because the wiper blades have been constructed to prevent snow and ice from building up. The blades do this by avoiding the exposure of any metal components that could cause this accumulation to occur. It has also got a natural rubber squeegee that is capable of handling all weather and is unlikely to get damaged or break in the process. Also the blades are incredibly flexible allowing them to have wider range on the windshield. Additionally, the also have a better grip on the glass, making for a cleaner swipe, each time they are activated. The blades are coated in blended graphite rubber. This means that the movements that are made are infinitely smoother. Not to mention, you will not have to bear any loud, annoying sounds either. Another perk with these wiper blades are that they are easy to install. This is because it comes with a multi adaptor that makes a suitable fit for all types of vehicles. Conclusion: Now you know which wiper blades will keep your windshield clean and clear while you are driving. By choosing any of these options present here, you can be reassured that you are making the right choice.